Do you owe this year in taxes and you need a little snack to make it better? Or do you have a nice refund check that’s burning a hole in your pocket? Either way, Tax Day falls on April 17 this year, and you know what that means: Businesses are offering some fun deals and discounts. Great American Cookies: Is offering a free Cookies and Cream cookie to people who stop by on Tuesday, April 17. You don’t have to show proof that you completed your taxes; just come on in and grab your treat! The deal is available at participating stores in the U.S. only. California Tortilla: Is giving away free chips and queso on Tuesday. “Just come in and say, ‘Chipping in,’ when you place your order,” the restaurant’s website says. Each guest can receive one order of small chips and queso with any purchase. The offer is valid in-store only, but not with any other offers, according to the site. Kona Ice: Has free shaved ice for you, come Tuesday. “On Tax Day, we want you to chill out with us. We believe in no taxation without relaxation. Find where your local Kona truck is going to be by going to this link,” the company said on Facebook. Schlotzsky’s: Will offer a free small “The Original” sandwich on Tuesday with the purchase of a medium fountain drink and chips. Noodles & Co.: Has “a deduction even the IRS can get behind,” according to a promotional email the company sent out: $4 off $10 on your online order from April 11-18 when you use the code TAXDAY18 as you check out. Hot Dog on a Stick: Is giving all customers one free original turkey or veggie dog on Tuesday. There’s no purchase or proof of completed taxes necessary. The deal is one per customer, participating locations only, the company said in a news release on its website. 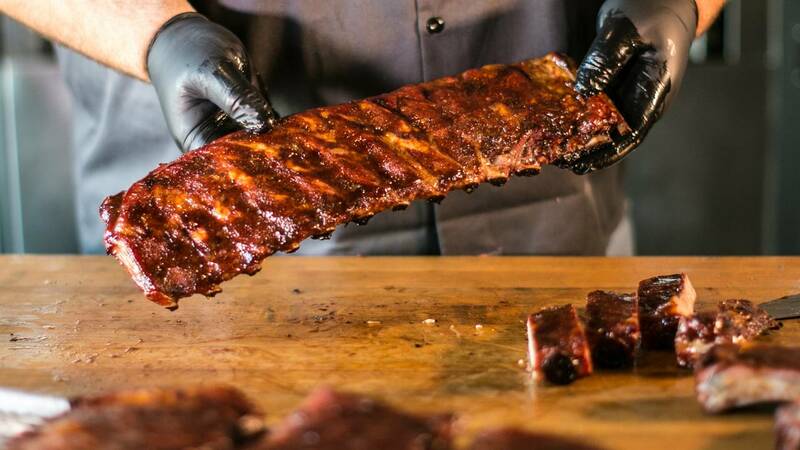 Sonny’s BBQ: Is offering the “IRS” -- Irresistible Rib Special -- on Tuesday. (These are the ribs pictured in the photo up top, in case you were wondering!) The promotion will run all day at Sonny’s 112 U.S. locations. The special includes half-price Sweet & Smokey or House Dry-Rubbed Rib Dinners (with two sidekicks and homemade bread.) The deal is valid for dine-in and takeout; for dinner portions only. No coupon is necessary. This doesn’t include baby backs or all-you-can eat. Bruegger’s Bagels: Will have a Big Bagel Bundle -- which includes 13 bagels and two tubs of cream cheese -- available through Tuesday, for the discounted price of $10.40 (get it? Like a 1040?) Visit the website to learn more. 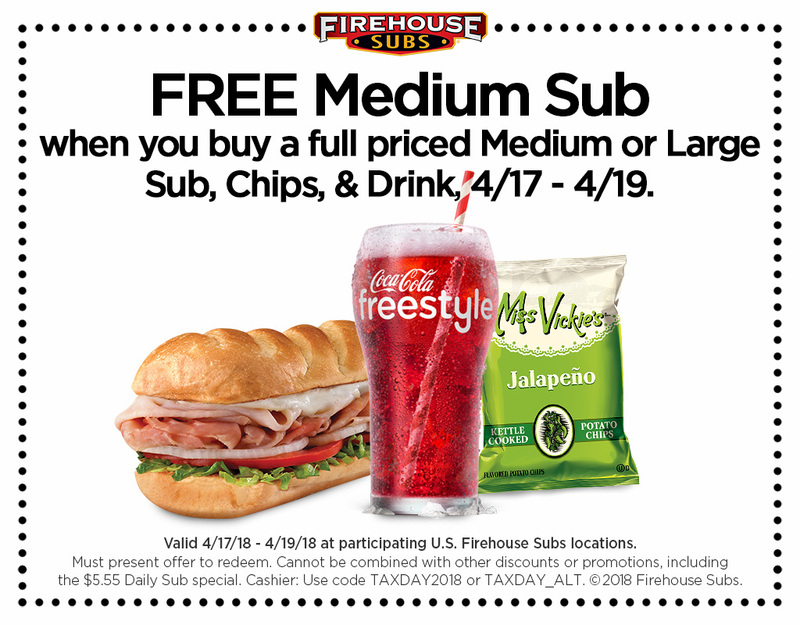 Firehouse Subs: Is offering a free medium sub with the purchase of a full-priced medium or large sub, chips and drink. This is valid Tuesday through Thursday when you show this coupon. Tony Roma’s: Is giving “a gift for all taxpayers,” according to the restaurant’s website, from Saturday through Tuesday: a free order of Kickin’ Shrimp. The deal is running at participating locations only, and isn’t valid with any other discounts, offers or promotions. The limit is one coupon per table, per visit. Get more information here. Hydromassage/Planet Fitness: Is letting people treat themselves to a free HydroMassage at any of the more than 1,500 Planet Fitness locations nationwide. The offer is available from Saturday through April 21. “De-stressers need only bring in a coupon, which will be available [by clicking here] starting April 14,” the website says. Click here to find a Planet Fitness near you. OfficeMax and Office Depot: Will let you shred up to five pounds of paper for free. The offer is valid through April 28 if you present this coupon. Our country’s national parks: Free admission -- OK, this isn’t really for Tax Day, but starting April 21, you can get in free of charge to celebrate National Park Week. Learn more here. We figured with taxes behind you, you could use some fresh air and time outside, unwinding. Know about a deal that we left off the list? Let us know in the comments below.